Last night, I watched the culmination of the Democratic National Convention. I'm sure glad I finally acquired a television set. It's been a few years since I've had tv, but I've gotten so used to being clueless as to what shows are popular that I might as well not have a set taking up 18 plus inches in my living room. Clinton was the first President I voted for and Clinton will be the first female President I vote for. I had planned on posting an interview an editor for this week, but all the parts are not yet in my mailbox so I will share a poem that I wrote over a year ago after hearing President Obama's eulogy for Reverend Pinckney last June. One of the videos this week, reminded me of the poem. Sometimes a word or an image will remind me of a poem that I have tucked away in a notebook or on my computer. This one was easy to find. Since when is the President, not your President? Will you move to Canada? Oops. You forgot Canada allows equal marriage. Will you move to France? You forgot France will not tolerated your ignorance. That's right. You don't speak the language. Is your solution a fence? the street your house is on is not spelled in English. English only. You voted for it. burritos three times a day. Which flag will you fly? President Obama Sings Amazing Grace. On the Road With Jesús. TTBF Opens Up. PEN Emerging Voices. 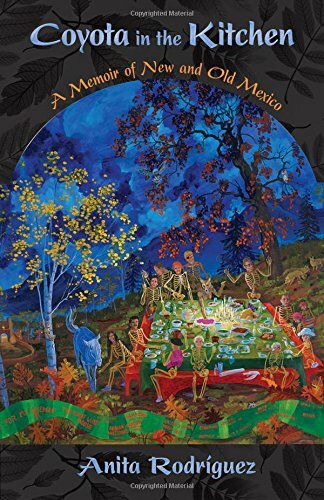 Next week, La Bloga-Tuesday joins Rudolfo Anaya in Alburquerque to interview him in conjunction with my review of Anaya’s latest novel, The Sorrows of Young Alfonso. Getting there is half the fun. This week, Jesús Treviño and I began a road trip to Anaya's home where Jesús will produce video interviews for Latinopia, as I gather material for La Bloga. Leaving behind the billowing smoke from the drought-fed Sand fire that rages in the mountains north of our LA area homes, Treviño and I looked forward to the cleaner air of the high desert. As a gloomy reminder of the suffering of folks in northern Los Angeles County, the smoke clouded the western horizon with tendrils infiltrating our route along Interstate 15 toward Las Vegas. Engaged in conversation and stunned by the amazing CDs of Lin-Manuel Miranda’s Hamilton, we cruised through Barstow and missed the cut-off for the direct route to Winslow AZ, the first stop of our itinerary. The arresting sight of what looked to be alien installations in the Mojave Desert stopped us in our tracks. Blinding white light glowed at the top of towers rising from shining blue lakes. 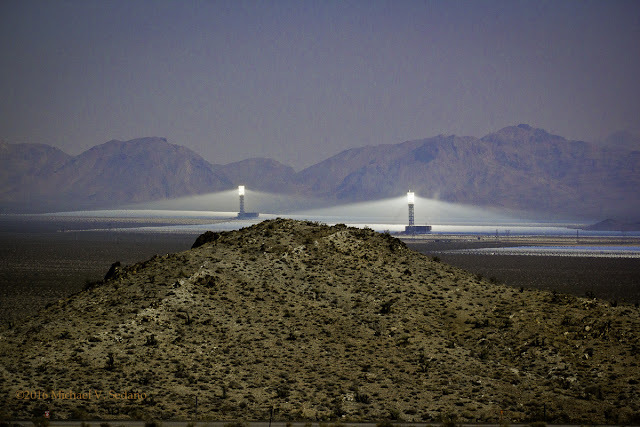 We took the Nipton Road exit for a better look at what I learned via the internet is the Ivanpah Solar Electric Generating System. The blue water is the sun reflecting from acres of mirrors installed at the base of solar energy collectors. These heliostats reflect light onto the solar receiver where the heat converts water to steam to drive electricity-generating turbines. Far from an alien attack, the wondrous installation represents a future of clean energy. 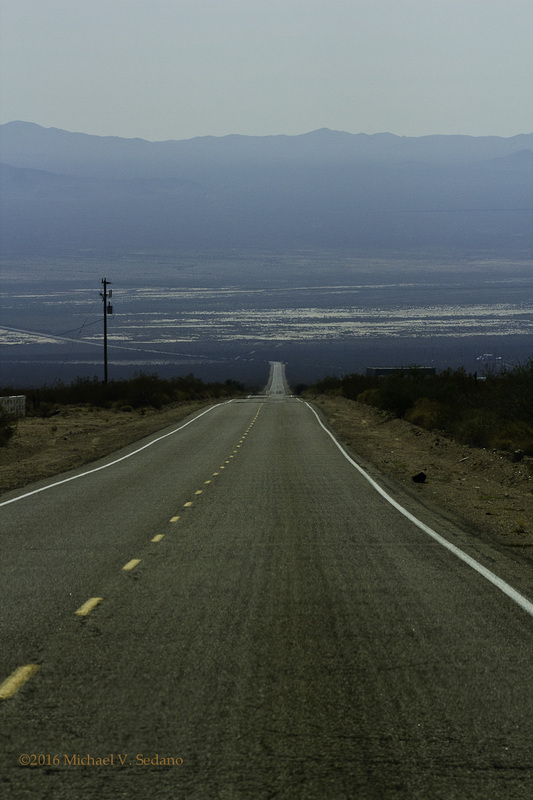 Highway 164 provides an enchanting route through a forest of small-limbed Joshua trees, remarkably dissimilar to the massive-trunked beauties of the Southern California desert. The landscape was dotted with spiky jumping cholla and salt bush. I spotted barrel cactus nestled among the basalt outcroppings that remind of the land’s ancient volcanic activity. The Joshua Tree Highway meets Highway 95 at Searchlight NV, where Terrible’s Roadhouse serves a hearty breakfast and, this morning, an empty casino featuring rows of slot machines. From Terrible’s Roadhouse the 95 takes us south to the I-40 and a trek across the Colorado River then up to the high country and piney woods of Flagstaff, where our journey treated we thirsty Californians to the rare and wondrous sight of spectacular lightning bolts and rain. 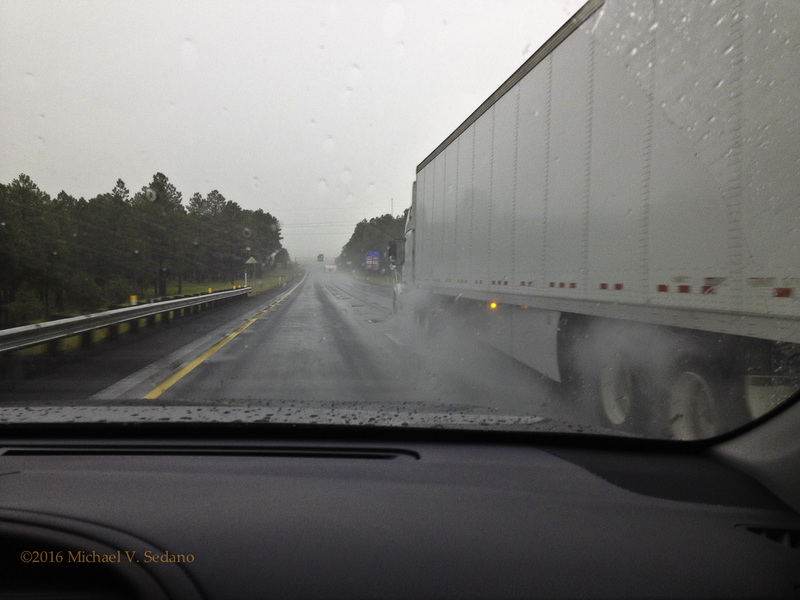 Treviño’s SUV seemed to leap with joy at the necessity of windshield wipers, but it was probably hydroplaning as the weather forced us to slow down. Nonetheless, we made excellent time and arrived at La Posada in Winslow Arizona. As we turned onto Second Street, tourists were taking photos with a bronze sculpture of a man standing on a corner in Winslow, Arizona. It was a fine sight to see the quaint hotel. As I walked to my second-floor room I looked at photographs of local men hauling coal from a nearby mine to the railroad, where cars would take the bitumen to a power plant somewhere to be converted into dirty particulate air pollution and non-renewable energy. La Posada wasn’t welcoming to one visitor, who was having a bad day. “That’s the way it is, John,” I heard one of five cops tell a fellow as I carried my luggage past angry confrontation. A few minutes later I watched from my window as John was catching a ride somewhere. 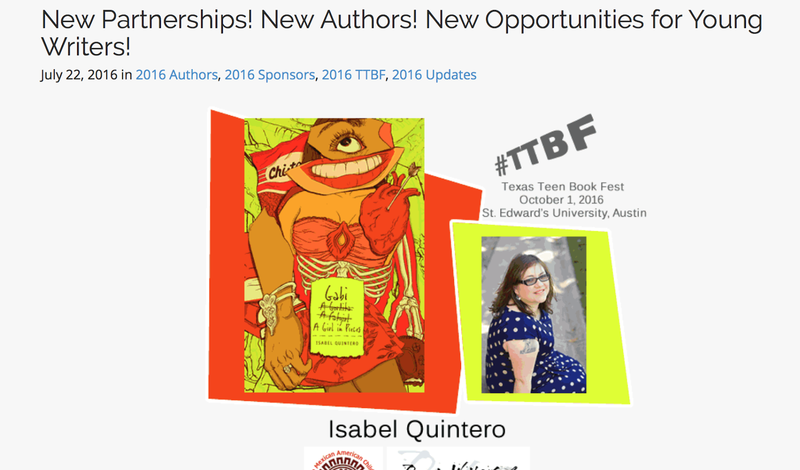 Last week, La Bloga-Tuesday had the immense honor of sharing a community’s restrained outrage that the Texas Teen Book Festival had omitted raza writers and books from the 2016 iteration of this important event scheduled for October 1 in Austin. El pueblo was definitely browned out by their exclusion from TTBF. Yet, the letter-writers composed with dignity, maturity, and honor, seeking rapprochement rather than rebellion. Their voices of reason made a difference and were met with open eyes and ears at the TTBF. We are beyond excited to announce that we have scored FOUR more amazing authors to add to our 2016 #TTBF lineup! So, ready your reading list for an update, and add four more great books to those pre-fest reading goals! Today we celebrate the addition of Guadalupe Garcia McCall, author of Shame the Stars; Joe Jiménez, author of Bloodline; Rene S. Perez II, author of Seeing Off the Johns; & Isabel Quintero, author of the award winning Gabi, A Girl in Pieces and recipient of the first annual Barrio Writers Featured Author Sponsorship, given this year in partnership with the Tomás Rivera Mexican American Children’s Book Award! El pueblo responds again. Sarah Rafael Garcia, who organized the letter-writing campaign, reports her email inbox is bulging with letters from gente expressing appreciation for TTBF’s response. La Bloga-Tuesday shares these next week. For today, here is a pair of responses from the community to the news. Please visit TTBF’s website for additional developments of a Barrio Writers Workshop and extended programming. Thank you for listening ears and a quick response to our concerns. I grew up reading nothing but white writers until I was in college. Palo Alto College was the first place I was introduced to and read any Latinx author. Had I not gone to college, I may have missed out. And too many of us do. I don’t want my daughters to grow up in a world where they don’t see themselves in reputable positions such as academia and literature, especially and more importantly, in our own state. It is not lost on me that this does not happen often. Our inclusion is something we always fight for, incessantly and loudly. We are born with this fight. We appreciate your attentiveness and the four new authors you’ve chosen. You went right into the heart of our neighborhoods and chose a Barrio Writer. Bravo! Then, you invited the Barrio Writers to host a writing workshop. That is community in action. I didn’t plan to attend the TTBF. That has changed. I’m elated to bring my family and invite my community. One of the greatest allies we could have in the push for diversity are people that listen to concerns and take decisive action to address these concerns. So I am here joining my fellow Latinx writers and poets in thanking the Texas Teen Book Festival and its sponsors for their recent decision to add four fantastic Latin@/Chican@ writers to their author list and a BarrioWriters workshop to the event. It shows me two things: One, engaging in constructive criticism and dialogue can bring about positive change. Two, the people (Texas Book Festival and BookPeople) running the show are truly concerned and are very receptive and welcoming of change. They have my praise and my thanks, and I look forward to a continued dialogue about diversity in young adult literature. I know that the concerns all of us writers have about YA lit are concerns that are best addressed through unity. After all, la unión hace la fuerza. PEN Center USA offers a fellowship application with an upcoming deadline. There's a ten dollar fee to apply. Here's an email from the fellowship coordinator. It's Ronisha, PEN Center USA's Emerging Voices Fellowship Program Outreach Coordinator. 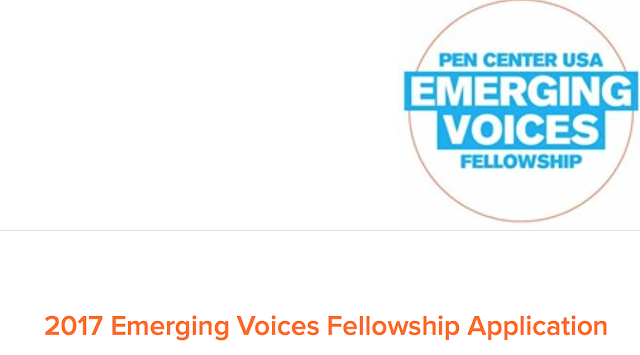 I emailed you recently about the Emerging Voices Fellowship application. The August 1st deadline is rapidly approaching and we would like to give potential applicants enough time to apply. 131 writers have successfully completed the fellowship since its inception in 1996, including writers like Natashia Deón and Cynthia Bond. Mentors have included such well-known talents as Sherman Alexie, Aimee Bender, Harryette Mullen, and Ron Carlson. We are not seeking paid advertisement but welcome you to feature the Emerging Voices Fellowship in your blog, journal, or magazine. By supporting our search, you are simultaneously supporting PEN Center USA's mission to defend freedom of expression and championing voices that would otherwise not be heard. We truly appreciate your help. Let me know if you have any other questions. Xánath Caraza (XC): ¿Quién es María de Lourdes Victoria? María de Lourdes Victoria (MLV): María de Lourdes Victoria es la abuela clueca de seis nietos hermosos. Es defensora empedernida de los derechos de las suegras metiches y de la literatura en español en los Estados Unidos. Cuentista desde su infancia, actualmente se dedica a escribir y publicar sus novelas (ficción) y a venderlas con el arrojo de una verdulera de mercado. XC: ¿Quién o quiénes guían tus primeras lecturas? MLV: Mi madrastra me introdujo a la lectura y sus padres me introdujeron a la literatura inglesa e irlandesa. 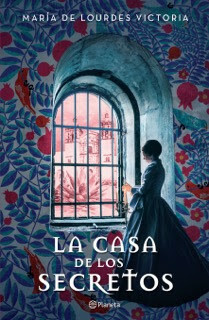 Tenían en su casita unos tomos hermosos con tapa de piel y hojas de papel cebolla de autores como Oscar Wilde, Blake, Joyce, Swift. Me prestaban los tomos siempre y cuando los tratara con mucho respeto. Hoy día esos mismo libros son parte de mi modesta biblioteca. Mi madrasta me los heredó. XC: ¿Cómo comienza el quehacer literario para María Victoria? MLV: Siempre fui escritora compulsiva. De niña escribía cartas que eran periódicos y las mandaba con su estampilla a mis tías o primos, o hermanos. No pensé en escribir una novela hasta que mis hijos llegaron a la adolescencia y parecían estar confundidos con su identidad. Quise que supieran de sus raíces y que sintieran orgullo de su familia mexicana, mis padres, sus abuelos, sus tíos, etc. Le pregunté a mi padre si me ayudaría a escribir una novela para que juntos les pudiéramos dejar ese legado no sólo a ellos sino al resto de sus nietos y bisnietos. Aceptó con gusto y esos seis años de entrevistas y convivencias fue la mejor vida compartida con él. Comencé a mandarles los capítulos a mi hermano Talí y a mi hermana Pilar. Un día Talí me habló para decirme que había enviado uno de mis capítulos a una editorial que se llamaba EDEMEX y que ellos le habían mandado un fax, de carácter urgente, diciendo que les interesaba publicar la novela (no usábamos la internet por aquel entonces). Mi sorpresa fue grande y el susto todavía mas grande. ¡La novela que querían comprar existía en mi imaginación! Así fue que comencé a leer lo que pude sobre el mundo de las editoriales y eventualmente le envié la novela, sin terminar, a la editorial que en ese entonces me recomendaron más para ese género. La historia le interesó a la editorial Ediciones B y en el 2006 la publicaron con el titulo Les Dejo el Mar (palabras del abuelo de mi padre a sus hijos al fallecer). Al final de su vida mi padre seguía releyendo la novela. Me conmovía encontrármelo así, en su silla mecedora de Tlacotalpan, con el libro en su regazo… Esa copia la recuperé y la tengo también en mi librero. En el nicho donde están sus cenizas mi hermano Manolo vio a bien grabar en la piedra “Les Dejo el Mar”. XC: ¿Tienes novelas favoritas de otros autores? ¿Pudieras compartir algunos párrafos y compartir un poco de tu reflexión/atracción hacia ese párrafo? -¿Qué día es hoy? - preguntó Pooh. -Es hoy – dijo Piglet. Creo que no tengo que no necesito explicar por qué. 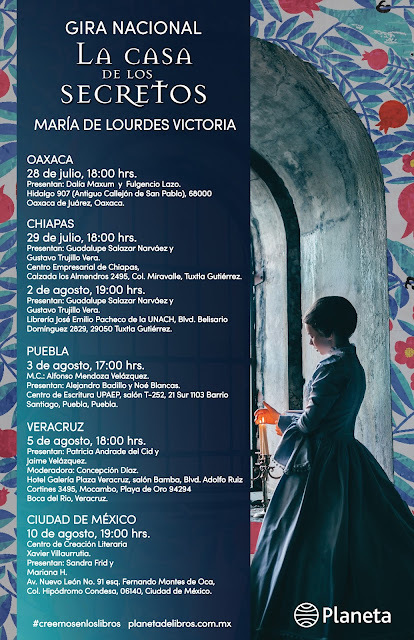 XC: ¿Cómo es un día de creación literaria para María Victoria? MVL: Me despierto a las cinco de la mañana, preparo mi café y escribo un par de horas. De ocho a diez de la mañana hago mi ejercicio matutino, me aseo y desayuno. Luego trabajo como maestra de español, y cuando termino me ocupo el resto del día jugando con mis nietos, o con los quehaceres del hogar. Por las noches edito lo que escribí por la mañana. Escribo en un escritorio y a veces parada en la cocina para descansar la espalda. XC: ¿Cuándo sabes que un texto está listo para ser leído? ¿Cómo has madurado como escritora? MVL: Yo soy como Gabriel García Márquez – nunca acabo mis obras, simplemente las abandono. No sé si he madurado como escritora pero de seguro mis lectores tienen alguna opinión al respecto. No obstante, yo sigo adelante, escribo y leo, leo y escribo y doy talleres de narración porque ese ejercicio me obliga a aprender. Mis estudiantes son mis grandes maestros. XC: ¿Qué tanto hay de México en lo que escribes? MVL: Puedo decir que todo, o casi todo lo que escribo tiene que ver con mi patria, ya sea como escenario de la trama, como en el caso de Les Dejo el Mar (Veracruz) o La Casa de los Secretos (Oaxaca). Mis personajes frecuentemente son mexicanos, como en mi segunda novela Mas Allá de la Justicia en la cual la protagonista es una abogada mexicana. En el género del cuento breve la temática de la inmigración, el exilio impuesto o voluntario, la nostalgia por la tierra madre, son temas recurrentes. La poesía igual, el ser bilingüe, el choque cultural, el idioma, el prejuicio, se cuelan en los versos a veces sin que me dé cuenta. Escribo lo que soy. XC: ¿Cuál piensas que es tu papel como mujer y escritora? ¿Crees que hay alguna responsabilidad? MVL: Creo que mi única responsabilidad es gozar de mi vida en plenitud. La vida es un obsequio y así la aprecio. La atesoro. Creo que cuando gozamos de nuestras vidas causamos armonía, paz y amor en nuestro entorno. Con suerte nuestros semejantes reciben ese amor y lo reproducen pero eso ya no está en mí sino en ellos. Escribo lo que me causa placer escribir. Algunos de mis lectores lo disfrutan y otros no. Ellos tienen la última palabra en cuanto al éxito comercial de mis obras. Yo tengo la última palabra en cuanto al éxito personal y el goce del proceso. XC: ¿En qué proyecto/proyectos estás trabajando ahora? MVL: Otra novela y el tema es el agua (o la carencia del agua). El escenario sigue siendo mi amada patria - México. XC: ¿Qué consejos tiene María Victoria para otros escritores que comienzan? MVL: La escritura es como la vejez, no es para cobardes. MVL: Quiero mencionar que Seattle es la cuna de Seattle Escribe que hoy día cuenta con más de sesenta escritores que radican en Seattle que escriben en español. Estoy feliz de que por fin nos estamos abriendo un espacio en este país los que elegimos escribir en nuestra lengua materna. My Bad: A Mile High Noir will be published by Arte Público Press at the end of September, 2016. I just finished going through my final nit-picky editing of the galleys. The next step, after we decide on a cover, will be for the Press to send the book to the printer. Yahoo! The rental was a blue and white toy, almost too small for me, but Luis told me the rates were cheap and I could park it almost anywhere without worrying about meters, tickets or gas. As I drove south on always-busy I-25 from the Northside to the Westwood neighborhood, I felt exposed, vulnerable, silly. The car was smaller than Corrine’s Kia. If any other car or truck hit me, my ride would crumble into a tiny ball of smashed metal and plastic, with me jellied in the middle of the ball. I knew how I looked to all the drivers who passed me, some honking their horns even though I was in the slow lane. In the tiny car I came off as a brown-skinned, muscle-bound hulk pressed up against the steering wheel of a car that had no business carrying me. Westwood was one of the few remaining neighborhoods in the Denver city limits where the word “barrio” still fit. Working families who’d been residents for decades, damaged but proud houses and small shops that dealt in everything from motorcycle repairs to marijuana cookies, all mixed together in a crooked rectangle bordered by Alameda, Mississippi, Federal and Sheridan. Tattoo artists collected books for neighborhood kids, Mexican taquerías sprung up and died like mushrooms, while the public art of Chicano artist Carlos Frésquez welcomed visitors to the community at Morrison Road, the diagonal street that cut through the heart of Westwood. I stood in darkness under a tall pine tree with rough branches and hoped that I would stay awake. I made myself as comfortable as possible. I bent my knees and squeezed into the darkness of the tree. From where I stood I could see the front and a side door, and a large dirty picture window covered with dark blinds or curtains. The night was filled with throbbing noise. Thumping bass rhythms mixed with barking dogs, ambulance sirens and hollering children. Screen doors slammed, water flowed along the curb and traffic moved on the major streets in a constant hum. I watched and waited and managed to stay awake until midnight, but I drifted in and out of awareness. Then I must have dozed off because I jerked against the tree when I heard a distant car alarm. A pickup truck painted primer gray sat on the gravel driveway that ran along the side of the house. It looked like a late 1970s Ford. The lights were still on in the house but there was no movement, no sign of any life. I wrote down the New Mexico license plate number hanging on the back of the pickup. I thought I could check that out back at the office and then Móntez could decide how he wanted to use the information, if it mattered at all. I hadn’t expected much, so even a license plate number struck me as worthwhile. I turned to walk to the rental car when headlights lit up my side of the street and I jumped back in the shadows. A dark, late model Camry pulled to a stop in front of the house. For almost five minutes nothing happened. The driver’s door opened and a woman stepped out. I couldn’t see her face because of the scarf wrapped around her head. She carried a large handbag. She rushed to the side door and tapped on the cracked wood. Light from the house surrounded her when the door opened. A man grabbed her arm and pulled her inside. The door slammed shut. I walked around the tree and looked for a way that I could approach the house without being seen. Such a route did not exist. As soon as I entered the street I would be exposed and in clear view from the picture window. I stood where I was and waited. Fifteen minutes. The side door opened abruptly. The woman emerged wrapping the scarf across her forehead. She ran out of the house, looked over her shoulder, then jumped in her car. She sped away almost immediately. Two minutes. 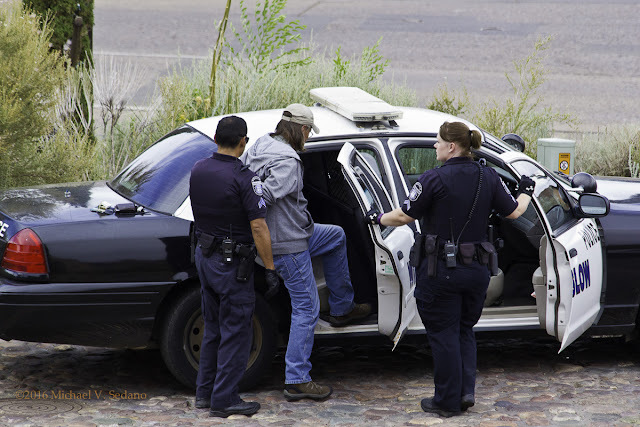 A tall man wearing a dark hoody slipped out of the house and climbed in the pickup truck. He backed out of the yard and drove down the street in the opposite direction from the woman. The lights in the house remained on. I looked up and down the street. I saw no one, not a kid on a bike or an old-timer out for a walk. It was late, I reminded myself. I ran across the street and peered in through the side door window. A man lay on the kitchen floor. He looked unconscious or dead. Then I saw the blood seeping out of a gaping wound on his right temple. I backed away from the door, checked the street again, then ran to my tree and called Móntez. “Get out of there and meet me at the office,” he said. “Get out of there,” he repeated. For an instant I toyed with the idea that no matter what Móntez said, I should report what I’d seen. But that old feeling crept up my spine and I reacted as I always had. I didn’t want to connect with the police right then. I jogged through the Westwood night back to the car, away from the bloody scene. I felt like the kid who was blamed for everything—the sucker, the punk, the kid who never knew what hit him. I couldn’t shake the feeling. I have several events lined up for the rest of this year, including a few for the new book. Hope to see you at one. I'll post the details here on La Bloga in the coming weeks.